When it comes to the sport of tennis, your equipment is only as good as its preservation. Tennis bags come in all sorts of shapes and sizes. Some feature rolling wheels while others increase capacity with 6-pack racquet holding capabilities. The sport also features many different levels of play, calling for some bags to suit one player over the other. To better help eliminate confusion and assist you in locating the proper storage, we have created a tennis bag buyer's guide. This guide will lend you important information as it relates to bag types, the selection process, and other such knowledge. We also have reviewed some of the top options on the market, detailing their unique features to help you select the correct option. Now that we have discussed some of the items to look for when buying, it is time to present some of the best options currently on the market. We will divide these options into two categories, one for men and one for women. 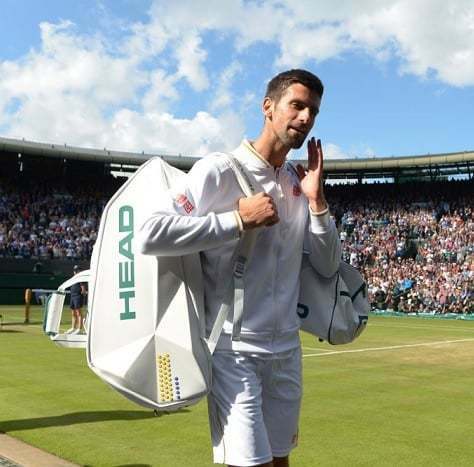 Most tennis bags will be versatile and can be used in a unisex nature, but some options have been tailored for the male and female players based on design techniques, sizing of the compartments, and themes. We will also announce the two best options following the reviews, providing you with the leading choice you should target in your search for the best bag. We start with a mecca in the sporting industry with Fila. Fila has been producing for the tennis community for quite some time, leaving their brand as a top contributor to the tennis bag space. This bag is a fully encompassing model, which means none of the racquet sticks out. This is an important piece due to the ailments that can be caused by weather conditions. The bag has two deep side pockets that are perfect for housing multiple tennis balls. There are two separate holding areas for racquets and each is infused with an ample amount of soft padding. The bag wears like a backpack with two thick straps to greet the shoulders of the user. Also included is thermal technology that keeps the racquet strings from losing their tension. This bag also hosts a separate compartment for shoes. This allocated space with fit shoes of any size, big or small. The next two options extend from the powerhouse contributor that is Wilson. The first is the Wilson Advantage II Tennis bag. This bag increases the width in the dimensions to compensate for three racquet holders. The increase on space also allows for the ample amount of room between racquets. This keeps the racquets free from rubbing. This model also features a smaller pocket for holding accessories. It was created to serve the purpose of racquet carrying, so it mimics the shape and design one would see in a guitar carrying case. It is functional, and the price remains friendly to the user. With Wilson, you are paying for quality goods that have underwent many hours of testing for functionality, durability, and overall quality. The second option is much larger in scale and is termed the Wilson Tour V 15. This bag assists the user in holding up to 15 different racquets at once. The holding is grouped by 5, so there is contact between the racquets. The large-scale model also allows for the user to make adjustments to the inner workings, which is something many other bags cannot claim. They can take out certain sections of padding and divisions and adjust to how they see fit. The space that is not used by the racquets can be transformed into a compartmentalized space for anything from shoes to sun glasses. It also comes with four pockets, two at each side. These pockets are ventilated and utilize thermal technology, making them fitting locations for anything from tennis balls to dirty clothes. Despite the large size and holding capabilities, this bag's price point falls within range of some of the smaller mentioned counterparts, making it a prime value play for the user. ​Our last two models differ slightly on the scale of design mechanisms, but both make for a fitting tennis duffle. The Adidas Squad III and the Adidas Defender III are two of the many different duffels that Adidas has released. Both extend from popular series in the brand, making them a popular item with consumers. 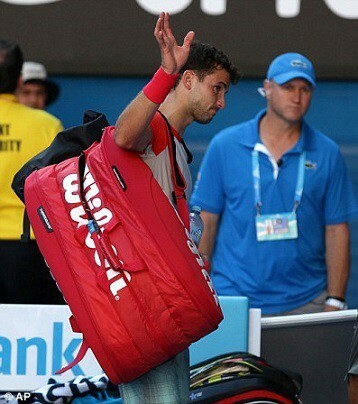 The duffle is often ignored in the tennis space because it is often branded for other sporting events. The duffle makes for one of the best dual-purpose tennis bags on the market. The dimensions of these bags already extend far beyond the length of the racquet, affording the user the ability to hold up to 6 racquets per duffle. Both bags have lined internal and external pockets. The external pockets feature ventilation systems, allowing for the contribution of clean air flow. The inner pockets are lined with mesh and feature an elastic component. This allows you to stretch these areas to hold whatever you need within. Both come equipped with a strong, padded shoulder strap and introduce Velcro clasping handles for dual carrying methods. Our first bag comes from a perennial super seller in Wilson. The Wilson brand is marked all over the sport of tennis with their products coming highly recommended to users. This bag features a nylon material designed with a black and pink color finish. The bag holds up to three racquets. The racquets sit sideways within the bag and host a few inches of spacing to reduce rub. The bag also comes equipped with additional accessory pockets for holding smaller objects or tennis balls. It hosts a long shoulder strap that can be extended. The strap features a moveable pad that will greet your shoulder to comfort at whichever location you see fit. The bag also has a stitched handle for carrying, providing an additional transportation method to reduce fatigue. Wilson also donates a percentage of each sale to breast cancer research, leaving a viable cause for the consumer to get behind. This bag suits the intermediate to casual player due to the smaller holding capacity and cheaper price point. LISH extends their products to the trendy space with their uniquely designed tennis backpacks. Each LISH bag is made from strengthened polyester materials, ensuring resistance to both the elements and abrasions. Each LISH bag comes equipped with elegant design markings, keeping the fashion forward for the casual tennis player. The bag holds 1 to 2 racquets comfortably, suiting the on-the-go player the best. The bag is sealing via zipper and draw string components, providing a proper upright hold for your racquets. The front area is expansive and creates about the same amount of space as the racquet holder. This paints a picture for the size of items you can also carry. It also comes with two padded back straps that go over the shoulders. A handle is also attached at the top to vary your carries. HEAD is another name that has gained precedence in the tennis world. They have been known for their racquet design and have dabbled in the carrying bag industry. This compact model works as a versatile carrying tool. Both sides are fitted with a slot for a tennis racquet, carrying 2 at a time. Since these pockets are on each side, division and proper holding are no worry to the consumer. The bag is constructed from leather materials, marking it as one of the most durable options. The middle section is where the user gains extra storage depth. It has space that would fit an outfit and a pair of shoes comfortably. The versatility continues at the carrying straps. These straps adjust, allowing the user the opportunity to wear as a backpack, throw over the shoulder, or carry like a shopping bag. Each strap is padded and removeable, allowing the user to adjust as they see fit. The last two options for women extend from a fashionable brand in Ame & Lulu. This company provides the gold standard when it comes to fashionable tennis carriers for women. The Cabana model and the Tour model both come in different design patterns. The patterns mimic the quality and design to that of high-end purse and bag companies. Strolling around with this brand with keep the user in a fashion forward mindset. The Cabana bag looks more like a large handbag with carrying straps. The straps are made from leather, ensuring the durability piece. The racquet lays at an angle within the bag, with ample amounts of padding to surround the main components of this tennis tool. This model also houses many lined pockets that keep your tennis balls and accessories separate and handy. The tour pro model comes with a matching tennis cover and ball holder. This model looks more like a fashionable duffle bag. Each piece has plenty of space to be housed within the bag and this bag holds upto three racquets comfortably. As you can see from the video, the biggest draw to any bag is the ability for the user compartmentalize. The different compartments help make for proper storage of all your gear and not just the racquets. This sense of flexibility can allow for both dual- purpose thinking and allows the user to gain full, extended use from their bag and equipment. Now, let's take some of these features into consideration for a deeper discussion. Two of he most commonly used materials in the tennis bag industry are polyurethane and nylon. Most bags feature outer coverage of these materials. These materials are often tough, abrasion resistant, and can even be treated to fight weather concerns. Higher end options will feature a leather treatment, which heightens the abrasion resistance while also raising the price tag. Other options are available, but often extend from options utilizing thinner materials. Mesh remains an option, but mesh will reduce the durability of the bag and could potentially pose a risk to your racquets and equipment. Sticking to polyurethane, nylon, and leather materials for the outer shell is the best choice for the consumer. As the bags relate to interior intrigue, there are many different forces at work that can make a bag standout. One of these features is the inner lining of the bag. Some bags are lined with mesh materials, which keep softer elements surrounding your equipment. This will provide resistance to scratches and scuffs. Other pockets will feature ventilation streams and air pockets to help both your equipment and wardrobe breathe. These lined areas will keep a steady flow of air going in and out of your bag, reducing the stench of used clothes, keeping your clothes fresh, and keeping your racquet tension to the desired tightness. The second form of lining deals with thermal capabilities. This relates directly to keeping your racquet to form and reducing any reductions placed on the strings. These thermal holding areas will keep your racquet in tip top shape and will reduce the amount of time spent restringing your racquets if they are not protected properly. Additional padding is common in the racquet holding space. Some will feature firm, foam holders that keep your racquets spaced out and in a secure position. Others will feature padding extensions that keeps your equipment from shifting when mobile. Some bags will also feature additional draw-string mesh bags within the larger bag. These bags often possess properties such as thermal heating or proper ventilation. These are used most often for your footwear and clothing. These additional bags can also be used to keep your tennis balls from losing pressure. Air pressure is a precious component of the tennis ball, so finding a bag that caters to this is something you should keep an eye out for. Due to the capabilities of tennis bags, they are often a bulky piece of luggage to haul around. To reduce injury and better help your stronghold on the bag, it is important to find the correct set of straps. One of the most common practices is to utilize backpack fashion straps. Two straps that go over the shoulders and a center clipping to reduce the fatigue presented to your back. The center clipping is an important component to this makeup because it keeps the bag secured and centered. This helps prevent the bag from shifting side to side during movement, which can present potential ailments. To reduce pressures placed on your shoulders, be sure to locate a set that features an ample amount of padding. Anywhere from 1-2 inches of padding helps reduce tension and pressure placed directly on the shoulders. The second is a standard shoulder strap that you place diagonally across the front of your body. The diagonal placement is important because is keeps the weight centered and doesn't present a disadvantage to either side of your body. The same thickness mentioned for backpack strapping in the padding region is a safe bet. Alter your carries from shoulder to shoulder to reduce placing too much pressure on one extremity. Most of these straps will be adjustable or removeable. A model that contains this feature is the best bet for the consumer. These straps are often clipped to the bag and if the bag doesn't have clips there are kits that you can buy to apply these holding devices. Straps that come attached aren't uncommon, which leads the discussion in favor of the backpacking method over the shoulder strap. It presents a greater center of gravity and spreads the weight to an even distribution. It also places less weight on any given area of your shoulders and back, which is an important note to consider. If you have had back problems or ailments in the past, the rolling bag is your best choice. These bags are designed much like luggage, possessing both 2-weel and 4-wheel swivel combinations. The preference on the wheel capabilities is at the discretion of the user, with no option providing a greater health benefit than the other. After discussing most of the important components of the bag, it is time to select the right size for you. Most touring professionals prefer the 9 to 12-pack sizing as they will change racquets multiple times during a match. These larger sizes are for the full-time player as they often possess all the incredible features but will also hold that large price tag. The casual player or intermediate talent will benefit most from the backpack carrier. These are standard in the 3 to 6-pack sizing, offering some additional space for holding for those who don't want to pack their bags full of racquets. It will also feature some of the benefits described, which is something players at any level can benefit from. The novice user or the month-to-month player can get away will a tennis duffle bag or one of the 1-pack carriers. While these items don't possess most of the greatest bells and whistles, they will be the cheapest option on the market. 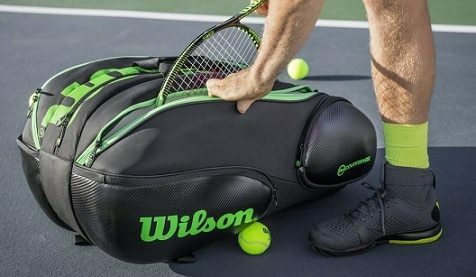 After reviewing some of the best bags on the market for men and women, it is clear to see that our top brand belongs to Wilson (Men's Wilson Tennis Bags, Women's Wilson Tennis Bags). The mentioned bags house the most components mentioned in our buying discussion, crossing the checklist off for most tennis players. The different sizing and stylings cater to both the male and female consumer, spreading the content to cover all skill levels. 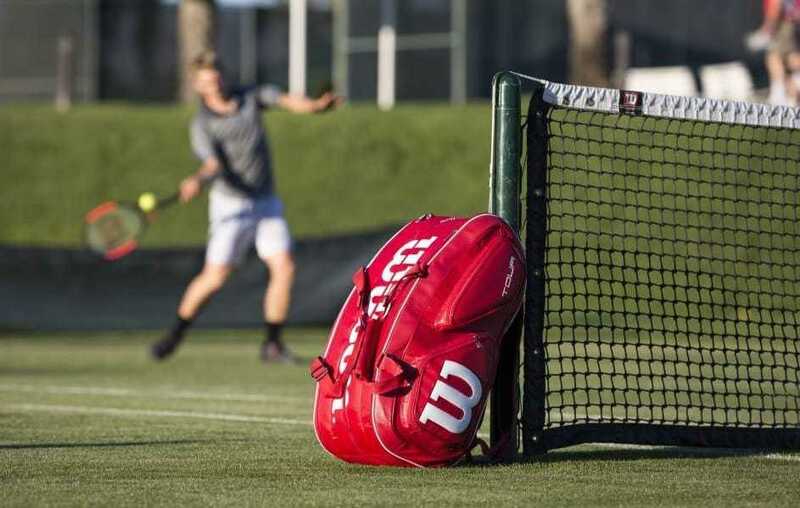 The design of the Wilson items sticks to the tennis-specific nature, leaving it as something that includes all elements of the game and the accessories it employs. As the size of the bag increases, the price tag remains relatively competitive and stable, which is something you don't see everyday with these major brand names. As it relates to racquet spacing, Wilson implements the proper in-between amounts while also hosting soft extensions that gently greet your racquets. The removeable straps is a staple for all of their bags, allowing the user to find that comfort sweet spot they desire. Remember to keep consistent the properties discussed today. Most bags, even if they are not termed as tennis bags, can be utilized for that purpose. If the depth and measurements add up to the correct amounts, you can transform any duffle into a suitable use option. The tennis specific bags take multiple considerations in determining the pocket holders, meticulously adding areas for specific purposing.